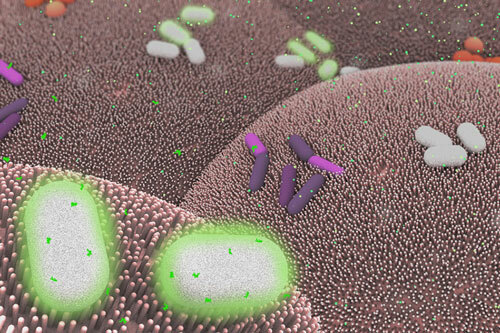 (Nanowerk News) The “friendly” bacteria inside our digestive systems are being given an upgrade, which may one day allow them to be programmed to detect and ultimately treat diseases such as colon cancer and immune disorders. In a paper published today in the journal Cell Systems, researchers at MIT unveil a series of sensors, memory switches, and circuits that can be encoded in the common human gut bacterium Bacteroides thetaiotaomicron. These basic computing elements will allow the bacteria to sense, memorize, and respond to signals in the gut, with future applications that might include the early detection and treatment of inflammatory bowel disease or colon cancer. Researchers have previously built genetic circuits inside model organisms such as E. coli. However, such strains are only found at low levels within the human gut, according to Timothy Lu, an associate professor of biological engineering and of electrical engineering and computer science, who led the research alongside Christopher Voigt, a professor of biological engineering at MIT. “We wanted to work with strains like B. thetaiotaomicron that are present in many people in abundant levels, and can stably colonize the gut for long periods of time,” Lu says. The team developed a series of genetic parts that can be used to precisely program gene expression within the bacteria. “Using these parts, we built four sensors that can be encoded in the bacterium’s DNA that respond to a signal to switch genes on and off inside B. thetaiotaomicron,” Voigt says. These can be food additives, including sugars, which allow the bacteria to be controlled by the food that is eaten by the host, Voigt adds. To sense and report on pathologies in the gut, including signs of bleeding or inflammation, the bacteria will need to remember this information and report it externally. To enable them to do this, the researchers equipped B. thetaiotaomicron with a form of genetic memory. They used a class of proteins known as recombinases, which can record information into bacterial DNA by recognizing specific DNA addresses and inverting their direction. The researchers also implemented a technology known as CRISPR interference, which can be used to control which genes are turned on or off in the bacterium. The researchers used it to modulate the ability of B. thetaiotaomicron to consume a specific nutrient and to resist being killed by an antimicrobial molecule. The researchers demonstrated that their set of genetic tools and switches functioned within B. thetaiotaomicron colonizing the gut of mice. When the mice were fed food containing the right ingredients, they showed that the bacteria could remember what the mice ate. The researchers now plan to expand the application of their tools to different species of Bacteroides. That is because the microbial makeup of the gut varies from person to person, meaning that a particular species might be the dominant bacteria in one patient, but not in others. “We aim to expand our genetic toolkit to a wide range of bacteria that are important commensal organisms in the human gut,” Lu says. The concept of using microbes to sense and respond to signs of disease could also be used elsewhere in the body, he adds. In addition, more advanced genetic computing circuits could be built upon this genetic toolkit in Bacteroides to enhance their performance as noninvasive diagnostics and therapeutics. Tom Ellis, group leader of the Centre for Synthetic Biology at Imperial College London, who was not involved in the research, says the paper takes many of the best tools that have been developed for synthetic biology applications with E. coli and moves them over to use with a common class of gut bacteria. “Whereas others have developed tools and applications for engineering genetic circuits, or biosensors, in bacteria that are then placed in the gut, this paper stands out from the crowd by first engineering a member of the Bacteroides genus, the most common type of bacteria found in our guts,” Ellis says. The study has so far shown the efficacy of the approach in mice, and there will be a long road ahead before it can be approved for use in humans, Ellis says.